Sun, Oct 14, 2018, 11:40 pm SL Time, ColomboPage News Desk, Sri Lanka. Oct 14, Colombo: Representatives of 40 countries were in Sri Lanka from 11-12 October 2018 to discuss the future of the Indian Ocean. "The Indian Ocean: Defining Our Future" , Track 1.5 dialogue brought together senior representatives from the Indian Ocean littoral states and major maritime users to Colombo on an initiative by Prime Minister Ranil Wickremesinghe, to increase focus on an Ocean that has the potential to become a growth pole in the world economy in the future. Representatives included, among others, key senior officials from India, South Africa, USA, China, Germany, Netherlands, Singapore, Indonesia and Japan together with key think tank representatives from the region and beyond. The UN Secretary-General's Special Envoy for the Ocean Ambassador Peter Thomson was also in Colombo for the Conference. President Maithripala Sirisena graced the occasion with his presence. Prime Minister Ranil Wickremesinghe, delivering the keynote address of the Conference highlighted the need to maintain Freedom of Navigation and Freedom of Digital Connectivity for the region to grow and prosper and the need for a shared understanding in order to maintain peace and security. This Conference provided an inclusive space for discussion and consensus building for littorals and users of the Indian Ocean. It explored four particular areas including the Indian Ocean's future as the new global growth pole, safety and security at sea, sustainable and low-pollution development, and stability of the Indian Ocean within a rules-based approach. -The rules-based international maritime order centered on UNCLOS needs strengthening and reinforcing for the benefit of the Indian Ocean littoral states and maritime users. 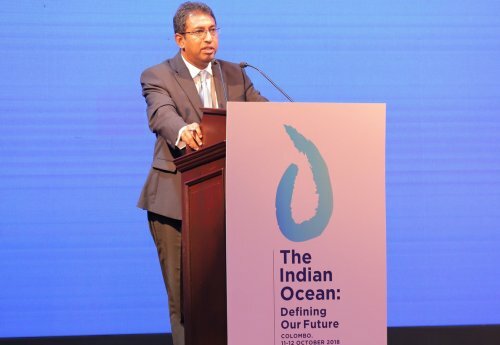 "The Indian Ocean: Defining Our Future" Conference was organized by the Office of the Prime Minister, Ministry of Foreign Affairs, Global Maritime Crime Programme of the UNODC and the Lakshman Kadirgamar Institute of International Relations and Strategic Studies (LKI) (Foreign Affairs Ministry).